Would you recommend LinkedIn Review, by Resume Worded to a friend? I'm always looking for ways to improve my LinkedIn profile so this was a good opportunity to test this tool out. Hello PH! Super excited to launch this today 🙌! 95% of all recruiters and hiring managers use LinkedIn to find candidates. Additionally, millions use their LinkedIn profiles to attract clients and prospects to their businesses. LinkedIn is more important than ever in building your personal brand and career. However, most people don’t take advantage of LinkedIn. Most profiles on LinkedIn are vague and aren’t optimized for what they’re looking for. This makes your profile harder to find and results in you missing out on opportunities. I built this tool to change that. Upload your (or anyone’s) public LinkedIn profile in PDF using LinkedIn’s ‘Save to PDF’ feature. 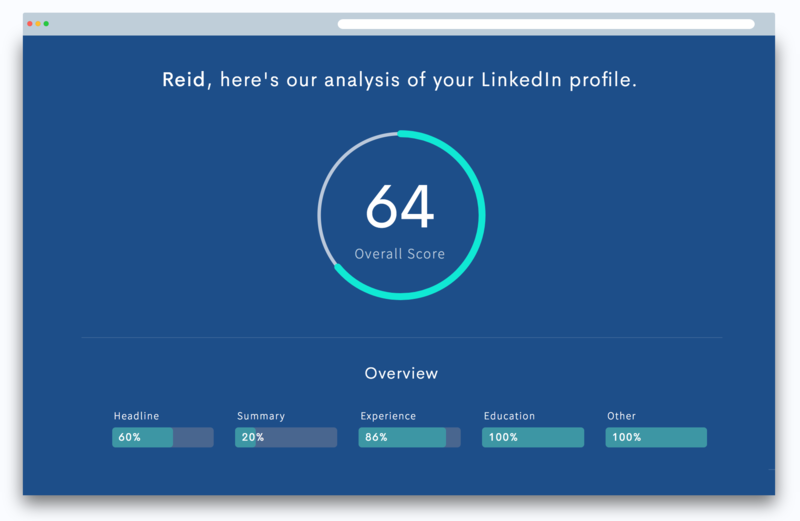 The analyser will: ✅ Score your LinkedIn profile against 50+ rules and criteria in seconds ✅ Give you specific, actionable feedback on how to improve your profile’s visibility and discoverability ✅ Grade each section of your profile, including your headline, summary and work experiences ✅ Help you achieve your career goals by generating more leads, opportunities and recruiter requests Plus, it’s 100% free 💪 You’ll also get a unique link that you can use to access your review at anytime. Try it for your own LinkedIn profile, or anyone else in your industry! You can ‘Save to PDF’ any profile on LinkedIn and upload it to the tool. For example, here are the results for Reid Hoffman’s profile! Any feedback is always appreciated, Rohan P.S. This product is a spin off to my main product, Resume Worded (https://resumeworded.com), which gives you recruiter-backed feedback on your resume, powered by AI. If you haven’t seen it already, I’d love for you to check it out. @rmahtani93 Pros: Great tips, easy and clear! Cons: Why not scrape the public profile instead of using the PDF? @akislaopodis Hey Akis! Many thanks for the positive feedback, much appreciated. Scraping is unfortunately against the LinkedIn's ToS, so we had to rule that out. The alternate plan that we considered was a 'Login with LinkedIn' button; however, the public profile that is returned from LinkedIn's API was limited and wasn't as complete as the PDF. The PDF option seemed perfect. It is one extra 10-second step, but it allows people to upload not only their profile, but anyone else's in their industry, in case they wanted to compare their profiles. Plus it's within LinkedIn's ToS & doesn't require any signup. @rmahtani93 How many times can I ask it to review my profile? Also, is it reviewed by a real person? @aafable Hey Aurora, you can upload your resume as many times as you like. No, your profile is analysed by our algorithms automatically and you get your feedback within 30 seconds. Definitely a great product! Many thanks to makers. It gives you an in depth review of your LinkedIn profile which you maybe were trying to learn by reading dozens of articles about "hot to make a stronger LinkedIn profile". Congratulations with the launch, so as far as I understand the recommendations will be personal, depending on your actions and current status of linkedin account. This is awesome. In 30 seconds I was able to add my profile and receive a number of high-quality practical suggestions to make my profile better. I scored high, 86, but still came away with a number of simple adjustments to make it even better. And it's free! Well done!